The Board of Investment of Sri Lanka (BOI) granted investment approval to MphasiS Lanka (Private) Limited. Chairman/ Director General Dhammika Perera signed the agreement on behalf of the BOI and presented the BOI Certificate of Registration to the investors. 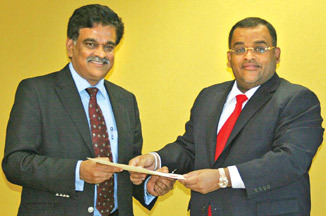 BOI Chairman/Director General Dhammika Perera (right) handing over the agreement to MphasiS Lanka Pvt Ltd Director M.G. Raghuraman. MphasiS Lanka signed an investment agreement worth US $ 3.5 million to establish a venture to provide IT enabled services. The company will provide employment for a work force of 500 initially. MphasiS is one of the fastest growing and dynamic Indian IT BPO companies. MphasiS, a leading IT services provider will expand its global talent footprint, with the establishment of a global delivery centre in Colombo. The centre will join MphasiS' network of global delivery centres providing Applications, BPO and ITO services to clients worldwide. MphasiS is the seventh largest IT services company in India having a presence across India, Singapore, China, Japan, Europe, North America and Australia. Employees at the Sri Lanka centre will be part of MphasiS Global Talent Pool and groomed as a part of MphasiS Talent Development Program. MphasiS is a leading applications services, remote infrastructure services and business process outsourcing services provider. The company delivers real improvements in business performance for clients through a combination of technology know-how, domain and process expertise. MphasiS will work towards developing and nurturing local talent. MphasiS is expected to work closely with the Government and academia in Sri Lanka, to focus on creating an industry ready talent pool. BOI has been actively working to promote the knowledge sector, IT/BPO/KPO to make use of Sri Lanka's high literacy rate in South Asia and to complement the growing IT BPO sector in India. MphasiS Lanka Limited Director M. G. Raghuraman, signed the agreement on behalf of the company. MphasiS' Head HR Leader, New Locations Learning (Technical and Domain) Usha Subramanian was present at the occasion. Executive Director Duminda Ariyasinghe, Senior Deputy Director A.W.M. Faizal Executive Assistant Kosala Harischandra and MphasiS Sri Lanka Consultant Nishendra Manathunga were also present.